Mwenya Kasonde is a freelance writer who specializes in writing for the health and beauty disciplines. She has been writing professionally since 2006, and writes primarily for LIVESTRONG.COM. She holds a Bachelor of Medicine, Surgery, Obstetrics and Gynecology from the Royal College of Surgeons in Ireland, and is currently preparing a manuscript for her first comprehensive guidebook to depressive illness. African-American hair differs from other hair in many ways. The most prominent differences are that black hair is thicker, it's made up of more cuticle layers and it's much curlier. It is also more prone to dryness and breakage. Because of this, special treatments such as hot oil can help you care for your black hair. Coconut oil stands out in the world of black hair care because it is one of the few oils that penetrates the hair instead of just coating the hair strand. The Research and Development Department of Marico Industries in India found that coconut oil benefits hair, and damaged hair in particular, by preventing protein loss. Black hair is particularly vulnerable to protein loss because the methods of styling commonly used on black hair are very harsh on hair -- for example, the use of chemical relaxers. Applying coconut oil allows the structure of the hair to be maintained, while hair becomes less prone to breakage. Jojoba oil has cleansing and moisturizing properties that benefit the hair. 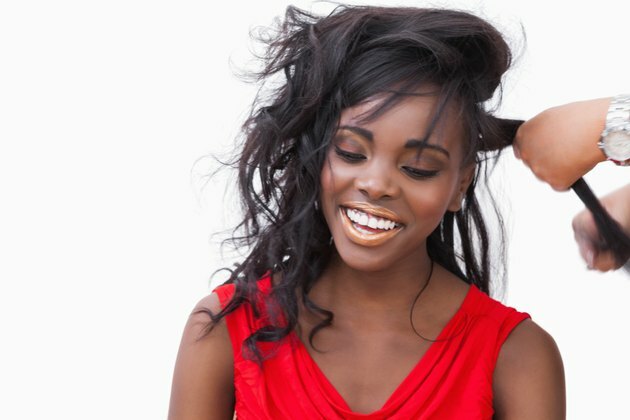 Adding moisture to black hair is particularly important. According to the "Gale Encyclopedia of Alternative Medicine," jojoba oil is similar to sebum, the natural oil that the scalp secretes. When used as a hot oil treatment, it mimics the natural conditioning of the hair, not only adding moisture but also removing buildup from environmental pollution or from excessive use of hair products. Carol Firenze, author of "The Passionate Olive," advocates the use of olive oil, in particular extra virgin olive oil, in the treatment of dandruff and for general hair conditioning. Being especially prone to dryness, black hair and the scalp need to be kept well hydrated, which olive oil treatments do very well. Olive oil is widely available in supermarkets and is a relatively inexpensive way of conditioning the hair. To do a good oil treatment on the hair, place a jar of the oil of your choice inside a bowl of hot water to warm up the oil. Do not allow the oil to get too hot or you could burn your scalp. Part the hair in sections about 1 inch thick and apply the oil liberally to the scalp and hair. Use an applicator bottle if necessary. Cover the hair with a plastic cap and sit under the dryer for 15 to 20 minutes. Rinse your hair, then wash it and style as usual. Apply a dime-sized amount of oil to the hair once styled.